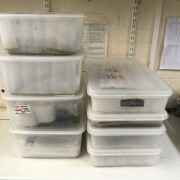 In our last blog entry, Post-Ex Diary 8: Specialist Analyses Part One, we discussed the importance of specialist investigation and the range of different analyses that are currently being carried out as part of the Must Farm project. We described some of the categories of research currently underway (Macrofossils: Plant Remains, Charcoal and Wood Fragments, Small Vertebrates, Micromorphology and Molluscs) and this second part continues our overview of the ongoing work. There were thousands of timbers present at the Must Farm site but there was little evidence of associated insects, such as wood borers. Does this indicate the settlement had only recently been constructed before it was destroyed? Initially, the presence of insects may seem largely tied to the environmental conditions at the settlement. However, these miniature creatures can offer a major insight into the human occupation of an archaeological site and are a very valuable component of post-excavation analysis. One aspect relating to insects we are exploring at Must Farm is investigating the presence of synanthropes, species that are typically found living with and around humans. Synanthropes benefit from a closeness to people finding places to live around homes or food sources to eat. With the quantity of worked wood at Must Farm, including the structural timbers and the palisade posts, we would expect to find lots of synanthropes related to all this material such as wood-boring beetles. However, there seems to be a significant lack of these types of insects present in wood from the settlement. Our interpretation that the site was short-lived seems to be supported by this absence, as if the site was only relatively recently constructed there wouldn’t have been enough time for synanthropic insects to have “moved in”. This absence is reflected in other insect species typically associated with human habitation, suggesting there was little time for them to settle in and establish a presence at the settlement. Examining microfossils, such as this Achnanthes diatom, can provide valuable information on the Must Farm settlement’s environment. Microfossils are microscopic remains which include plants, animals and bacteria amongst others. These tiny fossils are a very important element of the post-excavation process giving us an insight into environmental conditions and activities at Must Farm. The study of some microfossils is generally well known to non-archaeologists, such as pollen, while others are more seldom discussed (diatoms, chironomids and ostracods). Analysis of the pollen remains present in samples is providing information on the broader environment surrounding the Must Farm settlement. 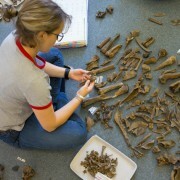 Studies so far are revealing a mixture of wetland and dryland conditions, which ties in with the different remains of animal species recovered during the excavation. Particularly interesting are pollens indicating nearby wet pasture conditions with alder and willow trees present. Alongside environmental information the pollen can give us an insight into the different crops present in the landscape to complement other forms of investigation into food residues and utensil use. Phytoliths are microscopic structures found in plants made from silica that survive after the organic material has decayed. These can be very useful for archaeologists as they typically persist within the archaeological record where organic remains would not. Many plants have specific phytoliths that are identifiable to specialists allowing us to determine what plants would have been present at a site. At Must Farm we are fortunate enough to still have the organic remains of numerous plant species, meaning phytoliths are playing a slightly less significant, though still essential, role than on dryland excavations. Diatoms, chironomids and ostracods are all microfossils relating to the river the settlement was built above. 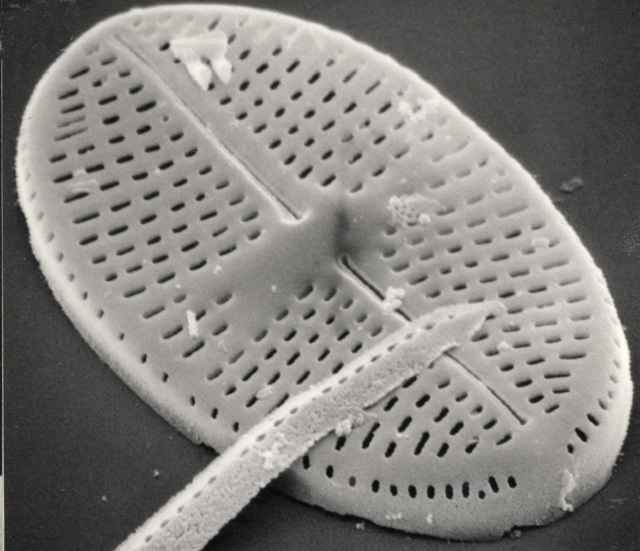 Diatoms are a form of algae that we’ve discussed in Dig Diary 23: Footprints and Posts which gave us some preliminary information on the shallowness and slowness of the water in the channel. Chironomids are small flies associated with aquatic environments and their analysis will help at understanding the river conditions in more detail, complementing the diatom research. 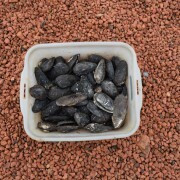 Finally, ostracods are shrimp-like creatures and their presence in the Must Farm samples can potentially provide an insight into how water quality is altered by human occupation. Although the brevity of the habitation at the site might complicate ostracod analysis. The post-excavation analysis of these three microfossils will be going into more depth (no pun intended) on the river channel and how the settlement affected it. Coprolites from the site, such as these well-preserved sheep/goat droppings can give us an insight into the health and diet of the human and animal inhabitants of the settlement. Coprolites are preserved faeces and, while not exactly as visually striking as a bronze axe or piece of 3,000-year-old textile, are incredibly exciting for archaeologists. At Must Farm we have already identified both human, dog and sheep coprolites from across the site and these prehistoric poos are allowing us to examine both diet and health. Coprolites can be examined using stable isotope analysis to explore what food a human or animal is eating. This is exciting as we can find out more about the food chain at the site and discover who is eating who. For example, are the dogs being fed diets of fish? Do the diets of the people from the site reflect the animal and plant remains found during the excavation? Alongside understanding the diets of the various inhabitants of the settlement, coprolites enable us to study the health of the site’s population. It is first necessary to separate out natural “background” parasite eggs and cysts, but once that is done it is possible to understand internal conditions. 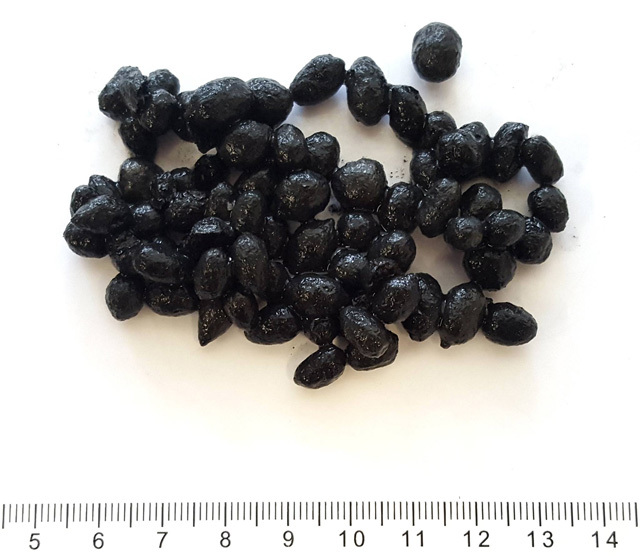 Specialist investigation has already identified possible intestinal parasites from human coprolites and work is currently ongoing in these areas of analysis. 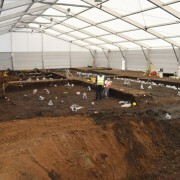 We’ve talked about the faunal assemblage both during the excavation (Dig Diary 35: The Must Farm “Menu”) and, more recently, in the refitting stages of post-excavation (Post-Ex Diary 6: Refitting Must Farm). Work is still ongoing focusing on studying individuals and refining our understanding of the complete assemblage. 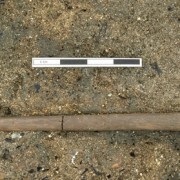 Examining distinct charring patterns on structural timbers is an essential form of analysis to try and understand the architecture of the stilted buildings from the settlement. The blaze that destroyed the structures at Must Farm, alongside the waterlogged environment of the river channel below, helped create beneficial preservation conditions for the site’s archaeology. These conditions were so favourable that a detailed investigation into the fire itself is possible where specialists are trying to establish the sequence of the events. To achieve this, it is necessary to examine the charring patterns on artefacts and timbers and try and reconstruct where in the structures these would have been. This process is complicated as it is essential to establish what is missing from the record alongside what has been recovered. While substantial timbers will have survived the fire will have destroyed a lot of other organic material potentially including items such as panels and matting. This is a complex process that requires working in reverse and viewing the structures differently from traditional archaeological perspectives. 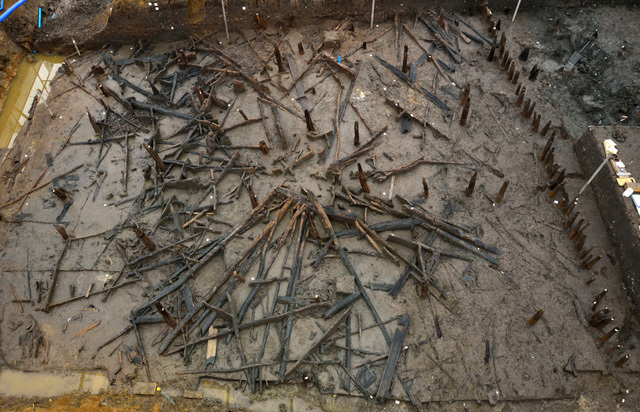 This is very much a continuous process and one which draws from other forms of post-excavation analysis to better inform the overall understanding of the construction of the stilted dwellings. Many of the vessels from the site had charred food crusts adhered to their interiors. Examining this can potentially reveal exactly what was being stored or prepared in the different jars, bowls and cups from the site. Must Farm’s pottery assemblage was an astonishingly complete range of vessels, ranging from the smallest cups to large storage jars. Organic residue analysis can identify different traces, such as animal fats, plant oils, waxes and resins, left behind in the archaeological record, typically on ceramics. 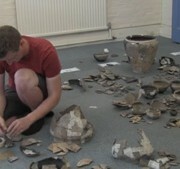 This form of specialist work is perfect for potentially understanding the uses and contents of pots from the Must Farm settlement. The refitting process we discussed late last year (Post-Ex Diary 6: Refitting Must Farm and Post-Ex Diary 7: The Must Farm Pottery Refit) gave us a complete overview of the range of vessel types. 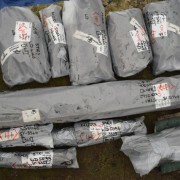 This allowed us to select pots of different types taken from across the site, both inside and outside the structures. Over 100 individual vessels will have organic residue analysis carried out which should give us an exciting glimpse into the contents and uses of the range of Must Farm pots. 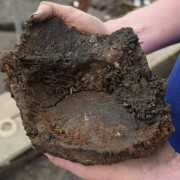 Many of the bowls found at the site contained a very recognisable blackened food crust created when the fillings of the vessels were subjected to the high temperatures of the fire. 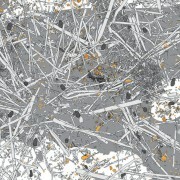 Identifying the presence of different microfossils within these charred crusts is another means of potentially recognising the contents of the pots. However, this specialist analysis is complicated by the intensity of the fire which altered and distorted the microfossils’ structures making identification even harder than normal. 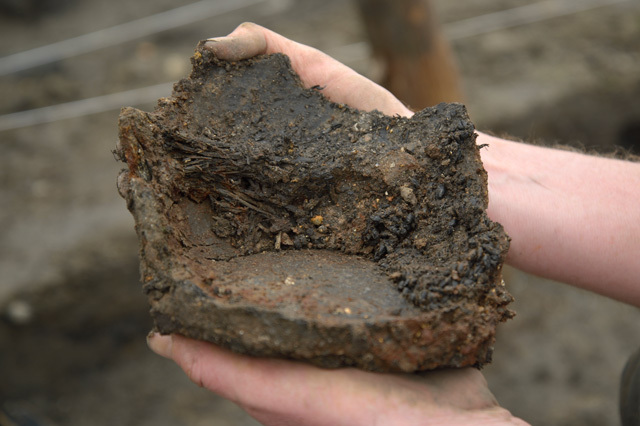 We know that the heat from the blaze was so hot that some of the organic material inside the vessels was vitrified! This wooden “beater”, thought to be associated with textile production, is one of the artefacts to be studied with use-wear analyses. Use-wear examines the markings left on artefacts including grinding tools such as querns alongside the many wooden objects from Must Farm. Analysis of the “querns” from the site is particularly interesting as we are keen to know what materials these artefacts were processing. Typically, querns are associated with the creation of flour and are made from tough or robust stone. However, during the excavation we found the remains of several flint grindstones that had been shattered from the thermal shock of being heated by the fire and then falling into cold water. Flint is a curious material to use for grinding foodstuffs as any small fragments removed during the processing would be razor-sharp and would have serious consequences if ingested. Use-wear looking at the surfaces of the flint “querns” suggests these may have been used for working wooden objects, functioning in a similar way to a rasp or file. With the quantity of wooden artefacts at the site, these flint processing tools would undoubtedly have been important. During the excavation we discussed the range of different wooden objects we were encountering (see Dig Diary 25: Wooden Objects). Owing to the rarity of surviving wooden artefacts it was often difficult to know exactly what these objects were and would have been used for. Examining the use-wear on these more unusual and less-common artefacts is valuable and provides us with more information to guide interpretations. 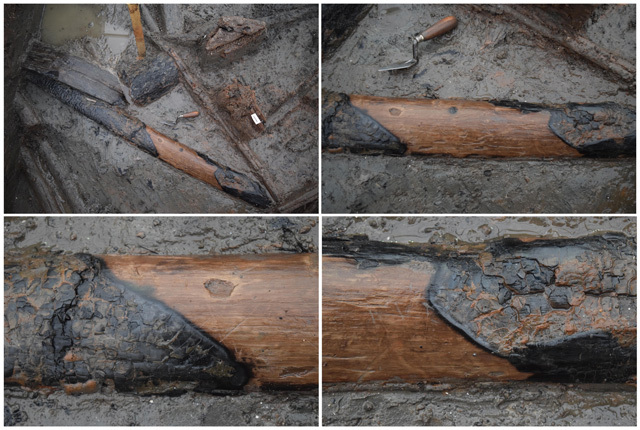 The wooden beaters, interpreted as processing tools involved in the production of textiles, are currently being studied and the results will be important in understanding the fibres and fabrics at the site. All metalwork from the site, such as this complete hafted axe, will be carefully analysed. Could certain metal objects have been made in the same batches using the same moulds? The Must Farm settlement has the UK’s largest Late Bronze Age collection of metalwork from a domestic context and includes a fantastic range of different artefacts, including axes, swords, spears, razors and more. As part of the post-excavation all the metalwork from the site will be carefully sampled to explore key areas including the composition of the bronzes and the conditions surrounding their creation. Initial specialist work has revealed that some of the artefacts appear to have been made from the same mould. Further scientific investigation can explore whether objects may have also been made together in the same batch by studying the different chemical signatures present in the metal. Similarly, the analyses will explore the hardness of the bronzes and determine the extent axes would have been sharpened and hammered. 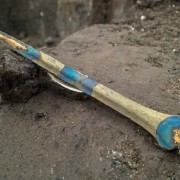 Work into the different metal artefacts is still ongoing and we hope to go into more detail on this aspect of the post-excavation in blogs later in the year. In the final part of this series we will continue exploring the different artefact and environmental analyses currently being carried out by our specialists.